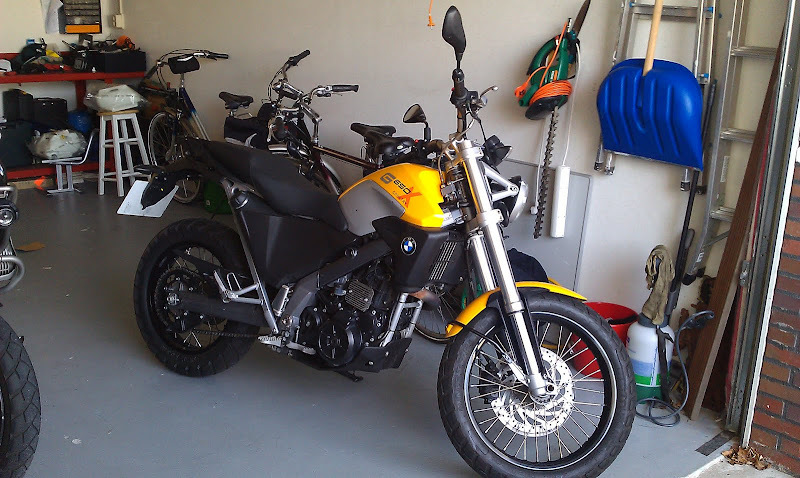 Discussion in 'Ride Reports - Epic Rides' started by mikecbrxx, Jul 2, 2012. 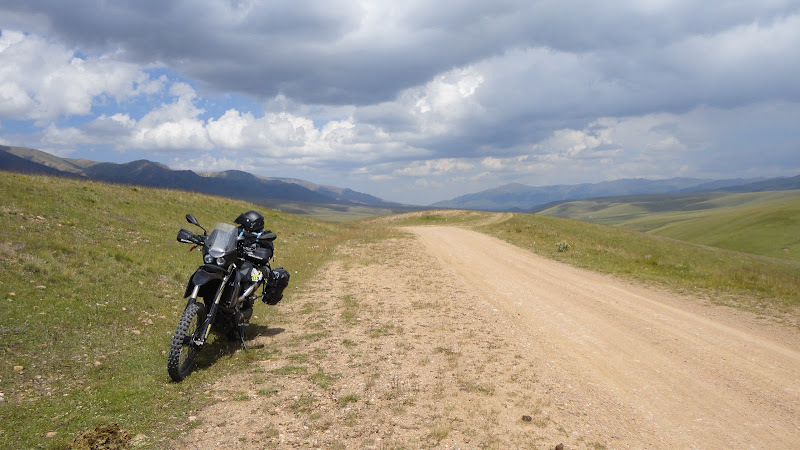 This project is to spend 5 weeks this summer riding some un-mapped routes in Kazakhstan, and maybe the Altai and Tuva Republics of Russia, to increase the track data for the area in the online Open Street Maps (OSM) Project. 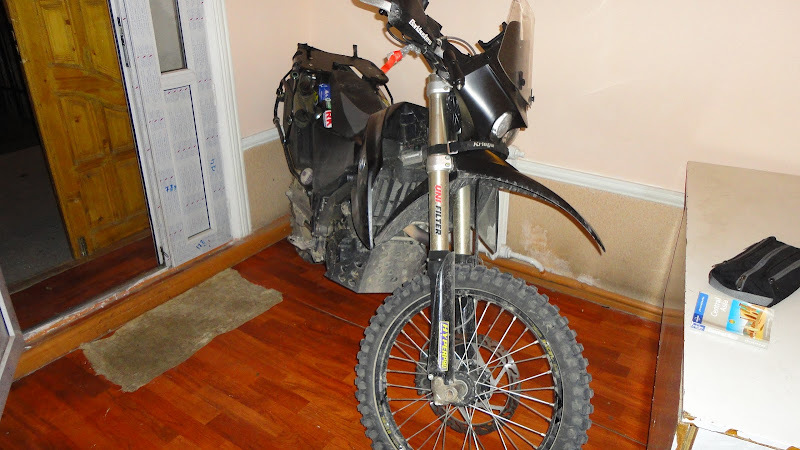 The bike I am using for the trip, formerly an X-Country but looking more like a Challenge now, is currently in a container, along with 11 other bikes from the Dutch AllRoadManiacs Group. 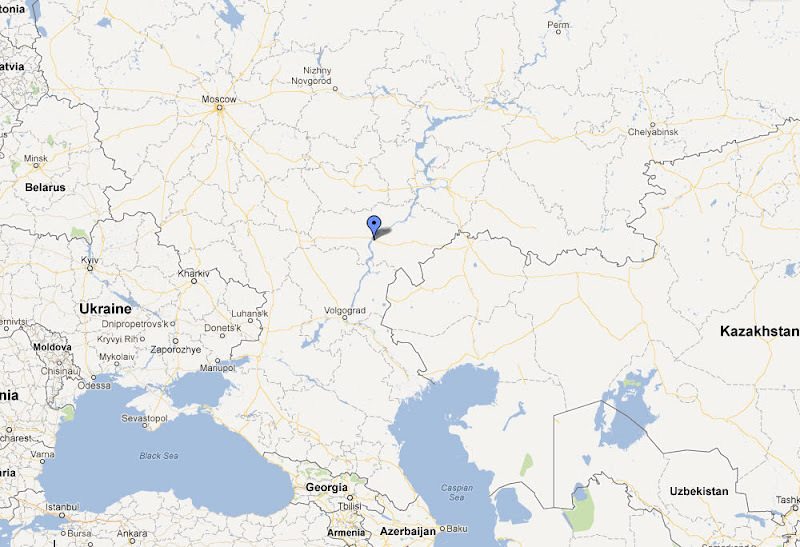 The container is somewhere in Russia on the back of a train on its way to Almaty. Here's a few photos to start things off. I bought this XC.....mostly as a result of Walter's travels and my own experience with the weight of the GSA! Along with the AllRoadManiacs ! 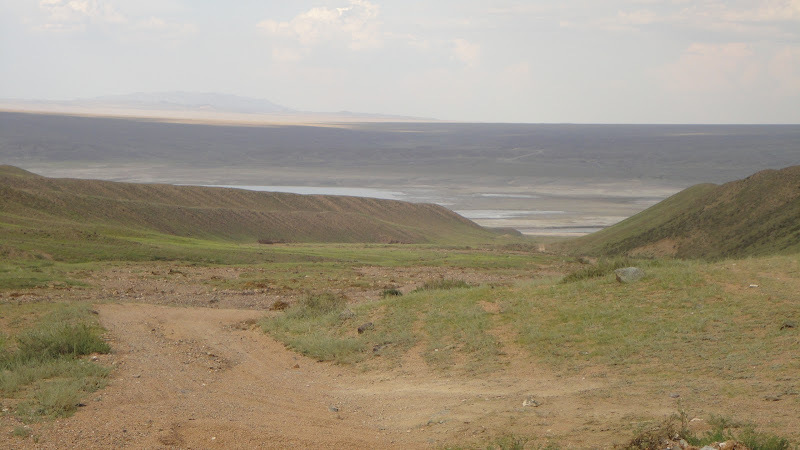 Proposed Route round Eastern Kazakhstan and across the top of Lake Balqash. The green line is the proposed route, the other colors are optional routes if I get blocked due to terrain or permit issues. I haven't got border permits unfortunately so I am hoping ignorance will get me through. Dogcam Sports in Cornwall, UK, have kindly loaned me a couple of bullit cameras to help record the trip and to supplement my handheld video camera. I have been doing business with this company for a number of years and have no reservations about recommending them to anyone looking for live action POV cameras. A big thank you to them for their support. btw: As the trip doesn't officially start till 13th, be patient for the next update, which will be from Almaty itself, assuming I can find WIFI. If there are any other riders planning to be in the Kazakhstan after 13th, feel free to get in touch, maybe our paths will cross! 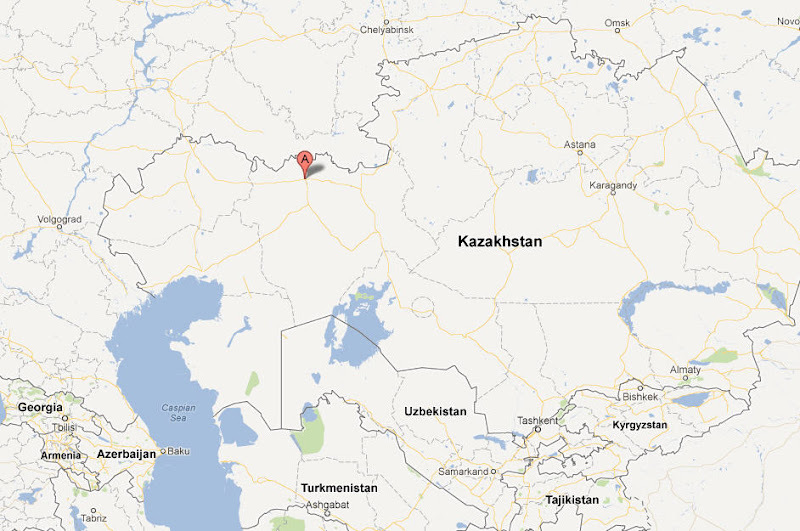 As of yesterday, this is the location of the container/train carrying our bikes to Almaty. Great bikes, great route, and helping OSM. I'm jealous ... and in! following you from Chile, safe ride. The airport at 05:30 when we left. We saw many wedding brides while walking round the centre of town.....well, it is Saturday, and loads of stretch limos. However, when we got to Panfilovtsiev park, they had all congregated in this area . There is some sort of flame in this park and each wedding party were having there photo taken by the flame. We arn´t sure why....does anyone know ? There are plenty more photos, but am tired so will post tomorrow or Monday. I´ll also try and identify some of the places we went during our random walk. The other 8 members of the AllRoadManiacs arrive tomorrow morning (04:00) so the group will be complete. While they catch up on some sleep, we intend to go visit Silk Road. Nice hotel! Not sure about the dodgy sauna downstairs. This is the Kazak Britisk University in Almaty. Photo taken from the south....or Uptown, from the same park as the tulip lights photo. Apparently it is Kazak tradition for wedding parties to have their photo taken bz this commemorative flame to the fallen in WW2. This isn't the onlz place that they go to......other places include the large central mosque and even the large ice skating centre about 30mins out of town. The building in the background is the Military History Museum. Note....for some reason my keyboard is playing up and transposing y and z. I have tried to catch all instances but if you see something out of place....sorrz ! On Sundaz, Ad, Jan, Martin and mzself went for another walk around Almaty, including a visit to Kok Tobe. This is a hill to the south of the city where there is a small amusement area and the Almaty telecom tower. See photos below. View over Almaty from the cable station on Kok Tobe. 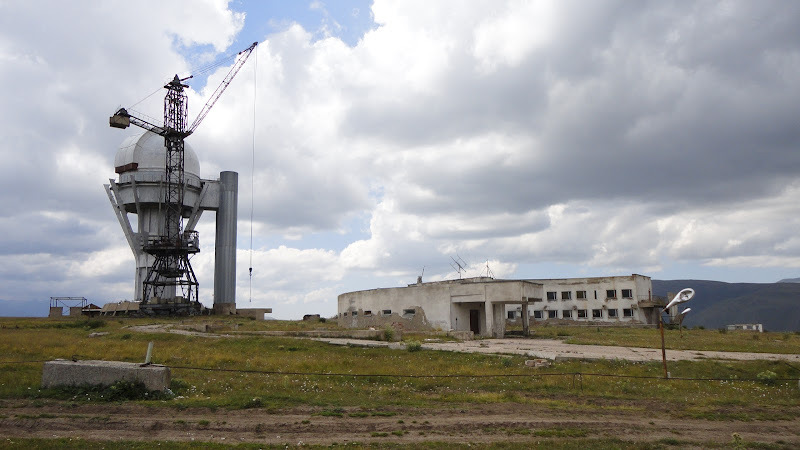 The bottom cable station is just above Hotel Kayakhstan, see later photo. We didn't find it so took taxi to near top then had a verz hot uphill walk to do the rest. I verz much advise using the cable. btw, Lonelz planet gives the price as 300 tenge each way....well now its 1000 tenge each way, or about 5.5 Euros. This is the Kayakhstan Hotel with the Guns and Roses Pub below. If you walk (uphill all the way) to this hotel, continue on uphill and there is the cable station. I have a waypoint but not at this moment, will post later. Last photo for this post is another shot of the Green Bazaar, but taken illegally inside the food hall. One of the later group got arrested for taking a similar photo. I think he got away without paying any fine. There were 2 police with him in the room, as soon as 1 left, the remaining one, opened a draw and invited him to put some money inside. Plazing dumb worked I think. While we were out, the bulk of the allroadmaniac group arrived at the hotel. The 2 Brits, Chris and Nick, came out with us for shashlik and a few beers on the Sunday evening but we didn't see the others till Monday. See next post. btw, for those bemoaning the lack of femail's in the photos so far, I will try to address this dereliction of duty soon.. There are some really beautiful ladies here and, like most of eastern Europe and Asia, are always smartly dressed. We were supposed to be collected at 1100 this morning to go to the bonded warehouse to get our bikes. This bacame 1230 and finally 1415 before we went anywhere. Once at the depot, our paperwork from the airport (was done by Yerzhan before we left airside) was collected and we had to wait to be given permission to enter the bonded side. This finally happened after 1600. The container was still sealed, good so far, and was unsealed in our presence. 2 workers then started to open the crates. At this time, we were told to keep back as it was their job. Later on, however, when they realised that the bikes were not ready to go (wheels out etc) they started to panic as the warehouse closed at 6! Finally, by box came out....last! We than had a mad rush to get the bikes back on their feet, batteries connected, screens replaced etc etc....the usual stuff after shipping. It was really hot and there was not one of us who was not filthy and soaked in sweat. Group shot of the yard just before we had to wheel them all out of the bonded side as it was 1800....The guy in Red is Nick, a school teacher from Devon. There was a group shot taken before we left....by Yerzhan. I hope to get a copy from him and will post when I can. Everyone else was just too tired and desperate to get on their way....me included. Reception followed by pool area. Latter photo taken from a lovely seated area where internet is available. While doin this update, I heard from another Dutch Rider who didn´t arrive with the group, he rode here via Finland and Russia. He had problems with his police registration as he was over the 5 days allowed. He has been fined 20.000 tenge.....about &#8364;105-110. He won´t get his passport till today so had to stay another night in Almaty. Filled my hydration pack and bought a few snacks for the day and set off about 10:00. 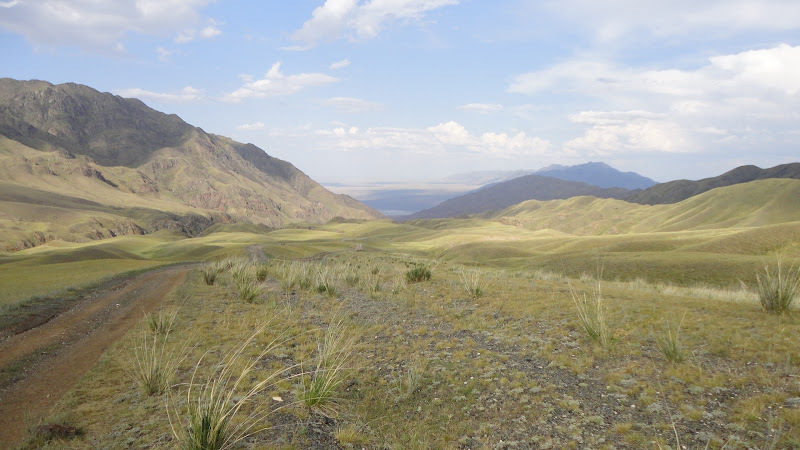 The plan for the day was to ride to a small town called Shonzhy (on my map though the sat nav has it as a different spelling) via the Turgen gorge, Assy plateau and Charyn Canyon. 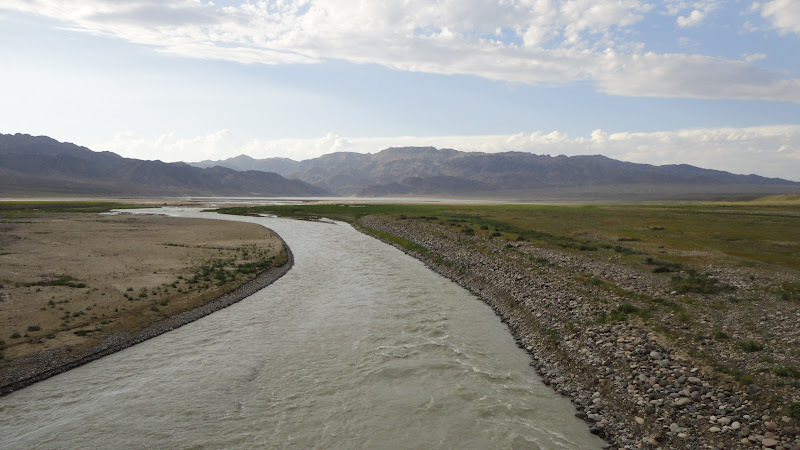 It wasn´t too difficult getting out of Almaty from the hotel and I was on tarmac all the way, through Issyk and into the Gorge. As I entered the gorge itself, there was an army (wearing combats) checkpoint to charge me 461 Tenge (361 + 80) for the privilege. That's about &#8364;2 and a bit. The tarmac continued for a few kms through the steep sided valley, along a river most of the way. The tarmac stopped at a turning place and a rough track continued on and began to rise sharply climbing to the plateau. My first minor off of the day was on this section....no real problem and was very low speed. 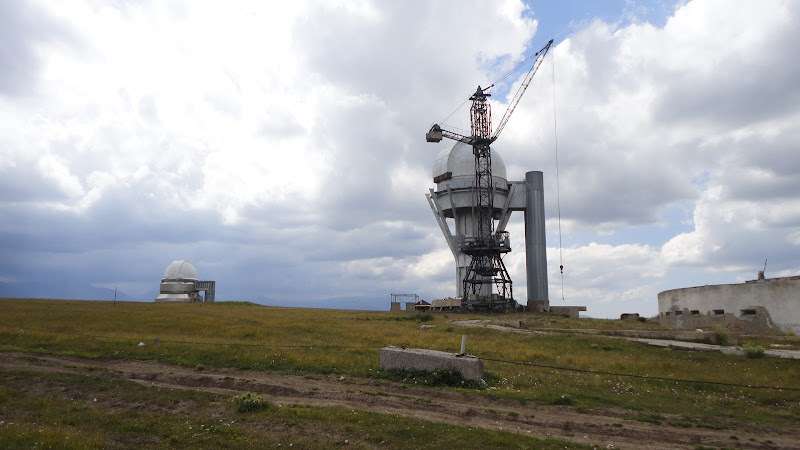 I took a slight detour at the top to visit the Assy Observatory sited at around 2600 meters. See below. The place was completely deserted. It actually looked as it did in many other pictures I had seen on Paramio so I am wondering if it was actually an abandoned project? This is looking the other way, across the plateau in the direction I was intending to travel. After descending a couple hundred meters again, the track continued across some grass land and alternated between good and bad sections. 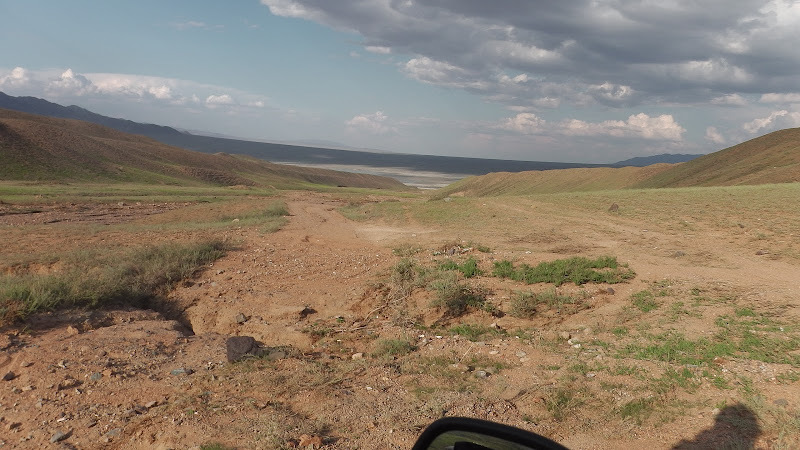 I passed a few 4x4´s and a truck driven by Kazakhs coming in the other direction. There were numerous Kazakh camps (summer?) tending to grazing cattle. 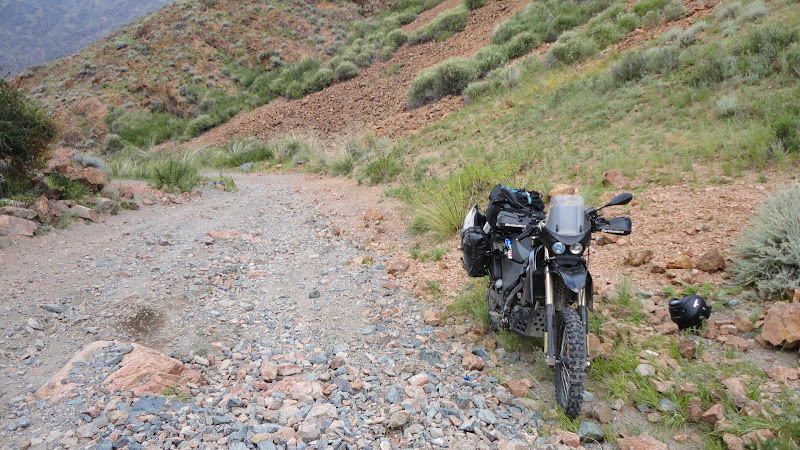 I rode through a few minor water crossings, but eventually came to the point that I had to cross a wide river, though split into several streams for the most part. One section, however, looked a little fast so I walked the bike across with the engine running and in gear. Half way across, in the deepest part, I lost footing and the bike went over on its right side (exhaust on the left). Much of the airbox was covered in water but the engine kept running, with me desperately trying to reach the kill switch under water. I managed it eventually....must have been lying there for 10 seconds though and not before before burning myself on the exhaust. Anyway, got the bike up....took a breather and while changing sides to start pushing it out, dropped it again, this time with me sitting down in the river too. So, got it up for a second time, finally managed to change sides and then took some time pushing it over some largish stones and out onto dry land. btw, I was being watched by 3 Kazakhs on a hillside not far away while this was going on, none moved to help. btbtw, I can vouch for the Wolfman panniers keeping water out.....all remained dry including the one that was completely submerged. No photos unfortunately....was rather busy at the time and I forgot. Eventually got going again, this time to a much tougher track. The picture below shows the bike on what must be a 30-35 degree uphill section. I came off 5 times trying to get up this part. If I had a heavier bike, I simply would not have made it. The picture does not really do it justice and the bike is in gear, the only thing keeping it there. Not too long after this section, there was my first glimpse of the reservoir that marked the end of this section of the trail. Still need to be very careful as the track was washed out in many places with deep and wide holes. The next photo doesn´t really do the hole justice.....would have been a new front end if I´d gone into that at any speed. Finally arrived at the bridge over the river out of the reservoir at 18:30, must later than I had hoped. 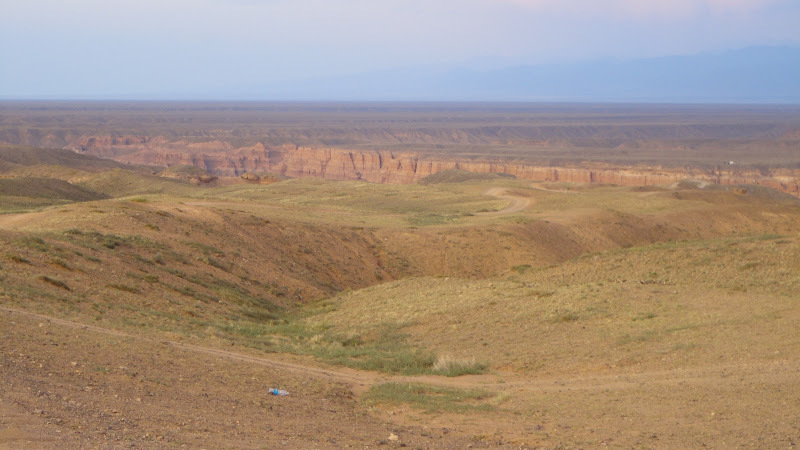 The track from here was gravel and sand, reasonably quick, for about 4 kms back to a tarmac b road leading to the main road to the Charyn Canyon turn. I had to make a decision. Did I go to the Canyon today and camp or try and find some lodgings? Opting for the former, I set off on the 50 ish kms to the canyon turn off then a further 10kms to the canyon itself. The sun was getting ready to set by this time. Then disaster....... just as I was riding along the track to the canyon, my hydration pack went dry. Hoping that there was someone still there, I continued on. Nope, completely deserted. I had no choice, I snapped a few quick photos and continued along the track towards Shonzhy in the north. The sun had set and I had about 20kms to do in what remained of the light. Giving it some gas, I had a crazy and dangerous ride in fading light hoping to get to tarmac before the light went completely. Made it, but only just. Arrived in Shonzhy about 22:00, parched. Got to the first store and downed a bottle of water and only then realised I had not needed the bathroom all day......hmmm, this was not good! Eventually found a small hotel.....I use the term very loosly. A group of young kazak truckers were also there, piled in 6 to a room. I got my own room with a matress that put steel to shame for hardness. The owner, and the trckers, were good, one had a few words of english. The owner and I managed to get my bike inside as it was the only secure place that it could go. 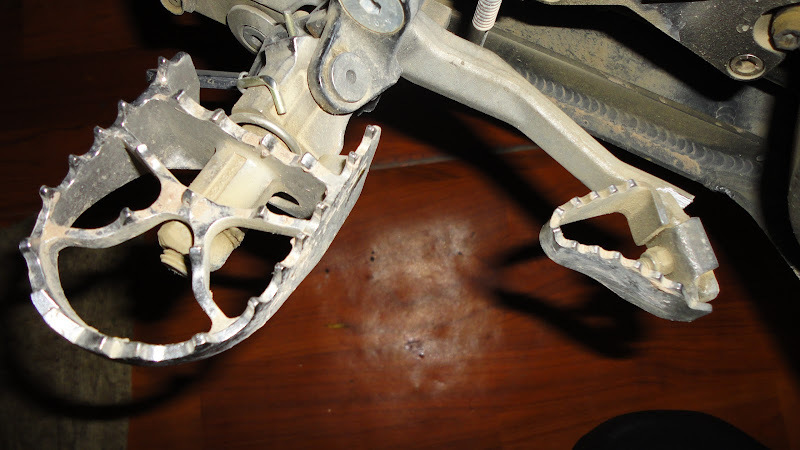 A few minor repairs were necessary, like putting my hand guards back into position following the off´s. This is my remodeled brake lever....still functioning as it should so not touched. 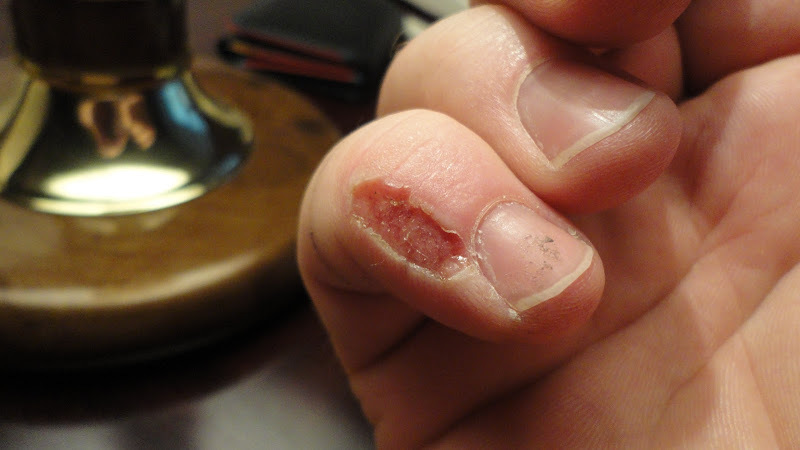 Finally got to bed after treating my burns from earlier in the day. During night woke up with severe pain/cramp in my left leg. Got up to walk it off and went very light headed. Sat on the floor and next thing I remember is waking up flat out. Pain had subsided. Thinking it was dehydration still, I drank plenty more water and went back to sleep. Felt fine in the morning....except every part of my body hurting and totally stiff. It appears I had over done it.